A macro view of Howardena Pindell’s practice reveals what Barry Schwabsky describes as a “rich dialectic”1 that negotiates the relationship between aesthetic and discursive experiences. As Schwabsky correctly points out, Pindell’s passion and commitment to engage both sense experience and intellect (ideas) in her practice conflicted with the general notion during the 1970s that these faculties are in opposition, and even today “this rich dialectic has not been critically grasped.”2 This failure to grasp is based on a binary—that sense experience functions as a property of one’s subjectivity, whereas ideas transcend the subjective into the domain of the universal, where we find concepts and ideas. In theories of art, this corresponds to a binary between aesthetic experience and criticality. Conventional thought regards the language of abstraction as aesthetic, and since Pindell is an abstract painter, this is how her work has been read. This is not a total misreading; she has expressed her commitment to the aesthetic experience. As she said in a 1980 interview, “I do work that tends to be very beautiful, very physical.”3 Pindell encourages us to read the paintings as an experience of visual pleasure (fig. 1). 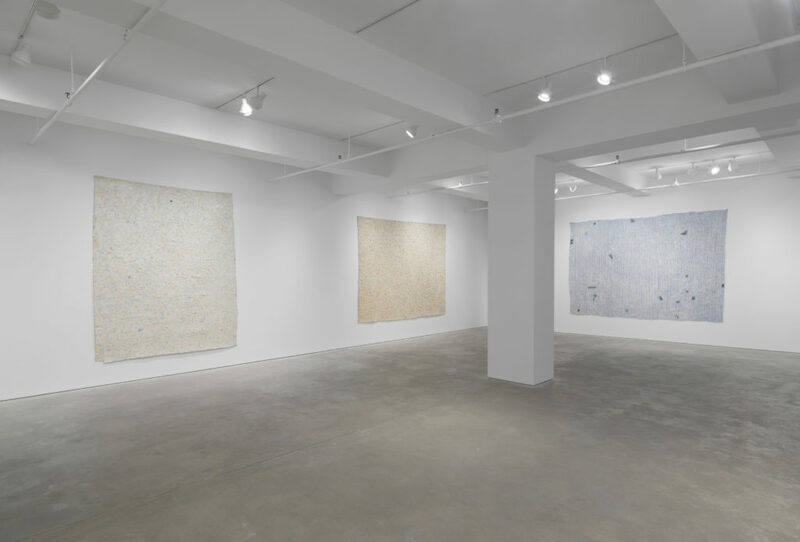 Installation view of Howardena Pindell: Paintings, 1974–1980, Garth Greenan Gallery, New York, April 10–May 17, 2014. But her definition of the aesthetic is not classically modernist and does not exclude a second component that is more critically and culturally oriented. It originates with her work in the late 1960s and 1970s that was a part of the avant-garde-driven interrogation of artistic practice such as postminimalism and conceptual art. For proof, we only have to look at early experiments with the grid as a compositional tool and conceptual trope in works such as Untitled (1968–70; fig. 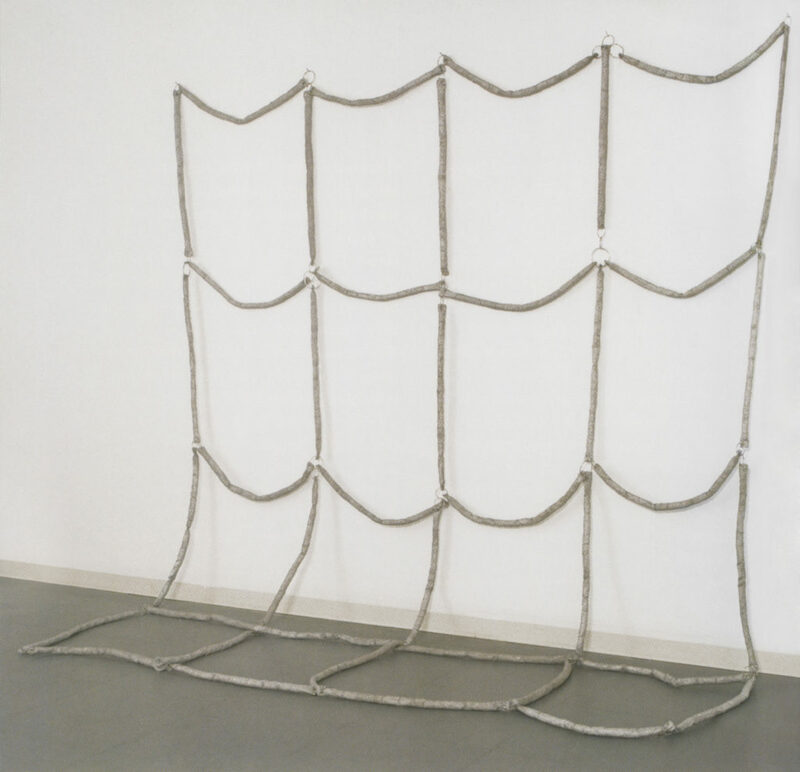 2), an early sculpture of a sixteen-unit grid form made of rolled canvas that is suspended on a wall at a height that allows the bottom row of cells to drape onto the floor. In this work, postminimalist reflections are present in the use of an ordinary object (canvas), and the installation implants a metaphor of intentionality to its physical characteristics, which redefines those characteristics as idiosyncratic behaviors of the grid. The standard grid is rigid and made of straight lines. 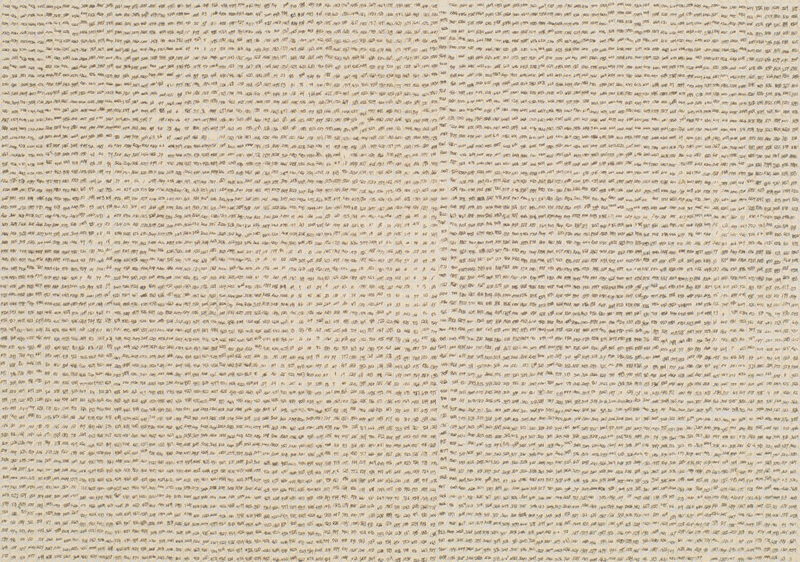 We are encouraged to read the grid form as “relaxed,” a metaphoric description of the gravitational effect of the rolled canvas on the form, which drapes like a clothesline in between its points of attachment to the wall. Linguistic interpretation of the rope-like material recalls other 1960s artists such as Robert Morris, Barry Le Va, and Lynda Benglis, who were also interested not just in the phenomenon of materiality or objectness, but also in the performative behavior of materials as activity as these effects marked a departure from the literal geometry of Donald Judd and Carl Andre. The minimalist and conceptualist grid is also present in Pindell’s work on paper, Untitled (1970; fig. 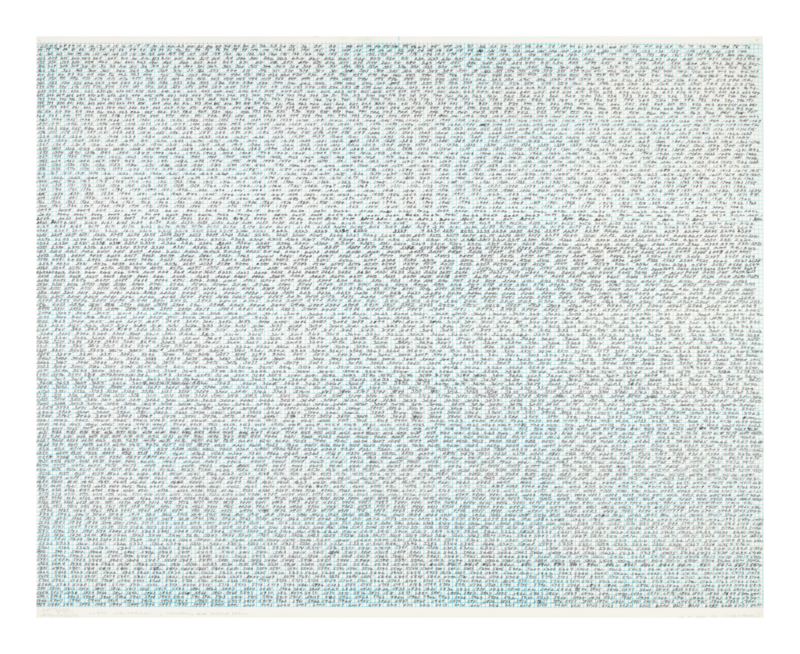 3), in which strips of ink-stained paper à la Sam Francis are woven together to form a grid and then adhered to a sheet of commercially made grid paper. Here Pindell begins to include certain intuitive practices in the form of abstract marks and gestures within the grid itself. In addition, we can see the beginning of her use of collage as a formal and expressive technique. Collage also serves her critical interests, in that it builds on the separateness of the grid paper from the painted strips of paper. This separateness, the grid paper (found object) from the painted strips of paper, can be seen as a binary opposition between postminimal/conceptual practices (grid paper) and painting. The found object grid paper reflects her interest in discursive content, while the painted strips reflect her commitment to aesthetics. This is read as a set of oppositions that is integrated into the collage, as the painted grid seems to echo the graph paper while at the same time announces its emancipation. How is it that collage in Pindell’s paintings and graphic works functions discursively and not only aesthetically? As Schwabsky points out, Pindell seems to have embraced both techniques on the level of theories of artistic practice and is clearly not willing to accept that they need to be binary opposites. Her embrace was a matter of her disposition and not a matter of theory. “I was very fond of Duchamp’s work,” she has said. “I was also very fond of landscape painting.”7 Schwabsky recognized that although these two types of practice were oppositional, for Pindell the relationship between them made sense; a personal narrative bound them, and her history with them was part of the development of her identity. Of course the question is: Are they subjectively linked, a matter of her aesthetic affinities, or discursively linked, a matter of her social experience? It’s easy to say it is both, but intellectual rigor requires us to explain how this squares with the binary that defines the terms as mutually exclusive as concepts (not as experiences). Here is where Schwabsky’s reference to a dialectical linkage makes sense. Responding to the earlier statement that her interest in aesthetics and concepts has not been critically grasped, making the idea of the dialectic graspable requires an ideological shift in our understanding of art, one that modernism resists because it requires the dismantling of the principle of the universal or totalizing experience that has become our normative understanding. As mentioned in the commentary on Kant, what stands in the way is a theory of modernist aesthetics where, with respect to works of art, we find not a dialectical relationship that links opposing ideas, but, because of history and art theory, two different and separable ideas about art where one view is that art is an expressive and aesthetic practice and the other view is that it is discursive and conceptual at its core. Collage is useful to overcome this difference by allowing Pindell to introduce into her work objects like the circles produced by the paper punch and tropes like her numerals as icons that reflect her experience; the formal language of abstraction must not subsume those elements (see Untitled, 1973; figs. 4, 5). Conversely, in order to have access to the critical and discursive content built into her abstract language, these objects and signs (numerals) have to be autonomously recognizable from the aesthetic interest of abstract painting. Pindell’s work, to my mind, achieves this latter requirement and is able to link the two concepts of art practice dialectically. This is the difference between a binary opposition and a dialectical opposition. The binary opposition never mediates the difference because each is in fact a tautology. However, in Hegelian dialectics, there is a requirement that an opposition, in order to be dialectical, must exist within an idea itself. So if we take the idea of a work of art, intellect and affect are dialectically related, and outside of this idea they could be pure binaries, or they may not be oppositional at all.8 The two terms would simply be separate, like a shoe and a horse. The result is that in these works the dialectical posits the two experiences as oppositional, not just different, and allows them to be negotiated in the same object. The idea of abstraction can then be negotiated culturally. In contrast, the conventions of modernism define the two experiences as different phenomena; an aesthetic experience is one thing and a discursive experience is another. Untitled, 1973. Ink on paper collage; 17 1/2 x 90 3/8 in. Untitled (detail), 1973. Ink on paper collage; 17 1/2 x 90 3/8 in. An examination of her use of numerical figures in the 1970s provides an illustration of this. As mentioned, Pindell’s professional practice had its entry during the heyday of postminimalism and conceptual art. So as we look at works such as 1–6031 with Additions, Corrections, and Coffee Stain (1973; fig. 6) and Untitled (1973; figs. 4, 5), we see the continued use of the grid that appears in earlier work. Both of these paper works had hand-drawn numbers whose values are randomly sequenced. In Untitled (1973), 20,000 of these randomly sequenced numbers10 are written on tiny punched-out paper circles arranged and attached in a grid of horizontal rows. Numerals became a central feature of conceptual art in the 1970s. They were deployed to advance a system or as empirical articulations and measures (see Mel Bochner, Roman Opałka, and Mario Merz). But Pindell’s use of numbers operates within a dialectical structure where, on the one hand, they were aesthetic markers, purely optical, pictorial, and graphic, with no conceptual or systematic intention, but on the other hand, numbers have iconic significance (her personal encounter with their relationship to African pattern). The fact that she could use tropes of her identity for their aesthetic or graphic qualities does not constitute a contradiction. The space of painting indulges both experiences. Conceptual art developed as a critique of expressionism that evolved out of European painting and on into American abstract expressionism. Conceptualism of the 1960s and 1970s was based on the idea of interrogating the possibilities of a work of art through an investigation of the structure of art itself. The minimalists approached this by advancing the idea of the art object existing outside of representation, to consider the idea of the artwork as an object, a thing in the world. To this end, their one strategy was to critique the idea of expression by producing art based in systems. Eventually conceptualism became an empirically based practice ruled by analytical language that articulated the work as a concept. In some cases, this was also realized by utilizing analytical markers as the art itself, basically because those markers constituted the formal language of the concept being advanced. Pindell’s use of numbers in her early 1970s paintings did not have this as a goal. She did not use numbers to invoke a system or any other effort to use a language of structure and analysis, or foreground such a language as the art form itself. She does not use numbers in order to advance their use in scientific inquiry. As we have established, her work is more autobiographical, as an image source that tropes a part of her experience. Her language is not scientific, but it is discursive; collage is a formal and technical strategy that lies more within the conventions of art itself. In ways that remind us of the more recent work of Mark Bradford, Pindell’s interest in the pictorial advances a traditional practice of art not just to advance an aesthetic, but also to affirm culture and identity through abstraction. 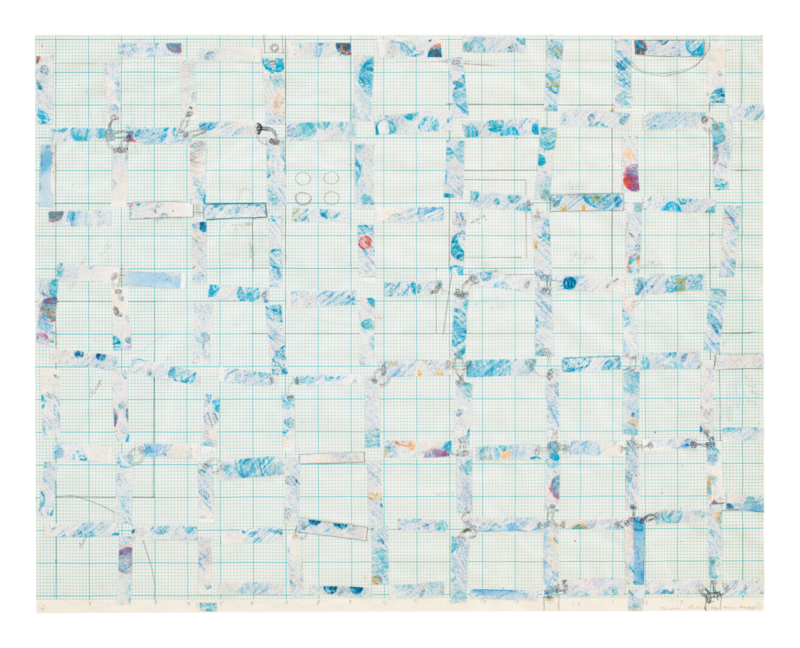 Barry Schwabsky, “Howardena Pindell in the 1970s: Development of the Grid,” in Howardena Pindell: Paintings, 1974–1980 (New York: Garth Greenan Gallery, 2014), 5. Ralph Rubinstein, “The Hole Truth,” Art in America, Oct. 30, 2014, at www.artinamericamagazine.com/news-features/magazine/the-hole-truth. Originally quoted in Kellie Jones, EyeMinded: Living and Writing Contemporary Art (Durham, NC: Duke University Press, 2011), 377. Pindell was commenting on her move from painting to her more politically oriented video and photography work. This is laid out in three of Kant’s treatises: his theory of aesthetics in the Critique of Judgment, and with respect to reason and logic in his Critique of Pure Reason and Critique of Practical Reason. See Werner S. Pluhar’s introduction in Immanuel Kant, Critique of Judgment (Indianapolis: Hackett Publishing, 1987), xxiii–xlvii. See Mary J. Gregor’s foreword in Immanuel Kant, Critique of Judgment, xvi. See Immanuel Kant, Critique of Judgment, xix. Barry Schwabsky, “Howardena Pindell in the 1970s,” 5. See “Howardena Pindell: Some Reminiscences and a Chronology,” in Howardena Pindell: Paintings and Drawings (Potsdam: Roland Gibson Gallery, Potsdam College of the State University of New York, 1992), 20. See “Hegel’s Dialectics,” in Stanford Encyclopedia of Philosophy, June 2016, at plato.stanford.edu/entries/hegel-dialectics. Howardena Pindell, quoted in Jessie L. Whitehead, “Theorizing Experience: Four Women Artists of Color,” Studies in Art Education 50, no. 1 (2008): 30. See also michaelrosenfeldart.com/artists/howardena-pindell-b1943.